Yes, that IS Gabe Davidson from the Wellington Chocolate Factory, in the middle of that shot. But where is he and who is he with? Well Gabe and Rochelle Harrison of the WCF are creating an even more wicked chapter in their exciting tale of how to keep making the best chocolate. 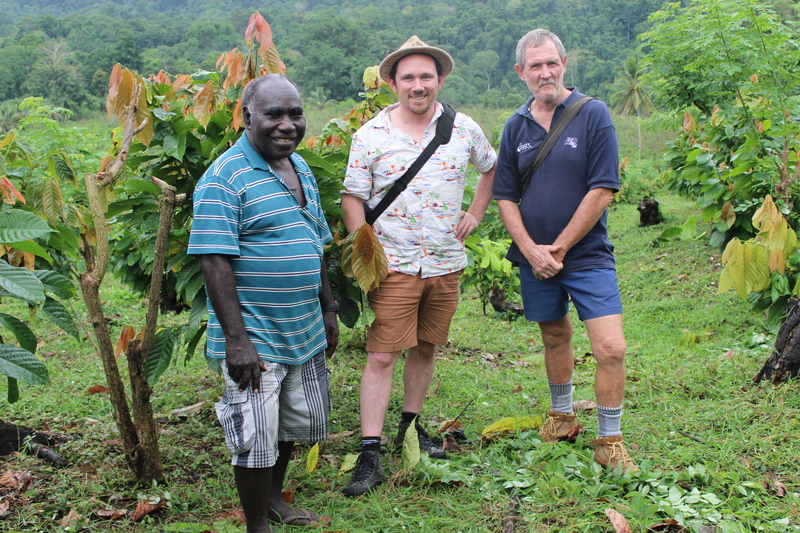 Now they see an opportunity in sourcing their cocoa beans from as local as possible by supporting PNG cocoa legend – James Rutana ( lovely guy on the left). James helped build Bougainville’s cocoa industry, only to see it get destroyed by war and neglect. But he is committed to rebuilding it and Gabe and Rochelle want to help him. And through this vision they could be on the cusp of creating a massive healthy industry for the Pacific and a new phase of the bean to bar chocolate we are growing to love. And we can all help.